Acne, psoriasis, and other skin issues- long known as an anti-bacterial and anti-inflammatory, lavender oil can be quite useful in treating skin issues. Bug Repellent – bugs of all kinds from mosquitoes to moths dislike the scent of lavender. If one does happen to still bite you, lavender is a good anti-inflammatory and can soothe the bite quickly. Nervous issues and anxiety – an infuser with lavender can have a warm soothing effect, as can a few drops on a scented cloth. Urinary Disorders – the anti-inflammatory properties help reduce inflammation while anti-bacterial and anti-viral help fend off other issues. Sleep problems – helps control insomnia and can help you sleep restfully through the night. Immune defense- it’s a wealth of help in supporting the immune system! Digestive health – digestive juices and all over digestive health responds well to lavender. You should never ingest the essential oils, themselves, however, although they may be used sparingly in beverage or food. Respiratory health – used in an infuser or in a dilute rub, lavender helps open airways and increase circulation to the lungs and entire respiratory system. Cancer prevention – there is evidence that by reducing inflammation, viral and bacterial activity and increasing circulation, lavender can aid in the prevention of cancer and in reducing the growth. Blood circulation – lavender supports a strong circulatory system which in turn is good for the entire body! Pain relief – it’s calming properties with the anti-inflammation action help relieve pain, naturally. Flavor enhancer – added to your favorite recipes and even smoothies and other beverage, lavender adds a wonderful flavor and fragrance! Are you ready to head for a relaxing bath immersed in lavender? 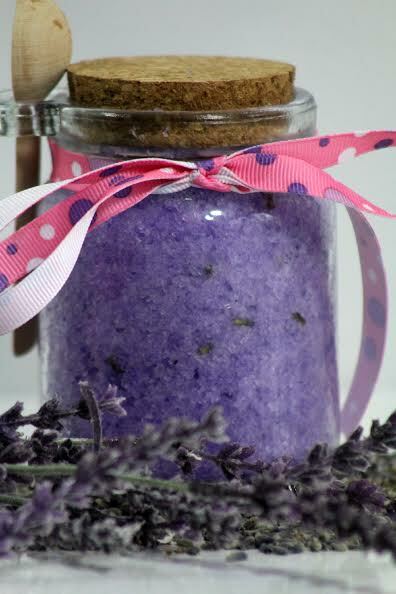 Try my Lavender Bath Scrub recipe! Stopping by from UBC. I love Lavender. Spritzing your pillow with it is supposed to help you sleep better at night. This sounds wonderful. I love the scent of lavender, and am going to grow it in my garden this summer. Now I really want to go soak in a lavender-scented bath . . . So many benefits and real aids of Lavender! , I had never known.